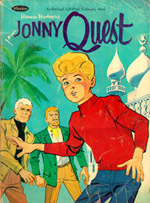 Despite this being an "authorized edition" (as stated on the inside title page) and the fact that the "Jonny Quest File O37" official trademark appears on the same page, this publication is interesting for the technical flaws contained therein. The most glaring is the misspelling of Hadji's name as "Haji". Also, Hadji spends the entire episode in his Indian street urchin garb, and Dr. Kareem (another misspelling) looks a lot like Dr. Quest instead of the Egyptian national he's suppossed to be. In fact, if it weren't for the hat Kareem wears, it would be very hard to tell them apart! Race's shirt is subtly wrong -- it closes down the front instead of off to one side. 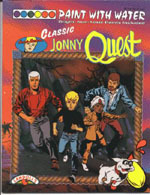 And the costuming on the cover is a radical departure from classic JQ -- Jonny's shirt is bright red, Race is wearing a black turtleneck with a jacket, and Dr. Quest is sporting an ascot! The book is a re-telling of the TV episode "Curse of Anubis" with some twists. For instance: there is NO MUMMY! Also: the scene on the TV episode where the boys try to sneak up on Race is depicted, but Race is in his street clothes (on the beach!) and he only manages to catch Jonny and Bandit; Hadji is relegated to "enoying the tussle" from the sidelines. At the desert hotel, Race merely captures the scorpion with the whip rather than destroying it. Kareem's associates are Egyptian soldiers rather than local nomads. 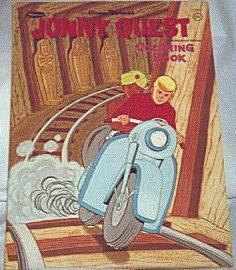 The door into the tomb where Dr. Quest and Race were trapped was brick and stone instead of wood. There were no poisonous adders for Dr. Quest and Race to worry about. There are numerous other omissions and other changed details, but you get the picture...to me, it just seemed a little...um...sloppy, especially for an "authorized edition." A fan reports that the coloring book is the same as the previous one, just with a different cover! 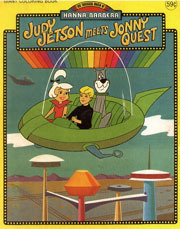 Copyright 1994 Hanna-Barbera Productions, Inc. Licensed by Turner Publications, Inc.